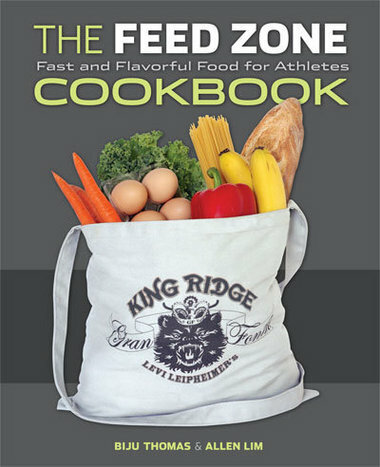 I have always been a believer that fresh and simple is better when it comes to cooking.This book really brings this concept to life.The Feed Zone lives up to its claim as a cookbook with “fast and flavorful food for athletes.”The recipes envelop the use of fresh whole foods and locally grown produce.As with most of my favorite cookbooks, it includes a lot of colorful mouth-watering pictures.I love pictures for garnishing ideas! As an athlete I have discovered that nutrition is very individual and what works for one may not work for another.The authors recognize this and encourage athletes to “become keen observers of their own bodies” and put the science of nutrition into practice embracing individual variability.There is a certain amount of common sense that goes into eating as well.I especially loved the part stating “if something you eat makes you feel like crap, then, all things being equal, stop eating it.”(My 12-year-old son really got a kick out of this line).If only eating were that simple.But I feel like understanding the “why” and “how” is certainly helpful and makes eating better a little easier. What I especially love about this book is the explanation at the beginning, “Feed Zone Lab” & “Feed Zone Kitchen” sections. They cover the ‘why’ and ‘how’ we should eat.The authors explore pre-workout, workout and post-workout foods as well as how to use macronutrients and cooking basics to help those that may feel help-less in the kitchen.This book can inspire even the most poorly nourished athlete to learn how to cook with healthy and simple ingredients.I also especially love the portables & après sessions for those of us always on the go or trying to optimize our recovery nutrition.There are some really great and yummy ideas.I love it! As I thumbed through the recipes marking all the tempting ones, I have discovered that I have marked the majority of the book.I can’t wait to dive into these recipes and give them all a try!These recipes really seem simple and very doable even with limited time. If you are looking for some great motivation to start eating better and fuel your body I highly recommend this book.You might even find your mouth watering as you read and view the colorful recipes and pictures.This book is hot off the press. This is a must-have for any athletes kitchen library.